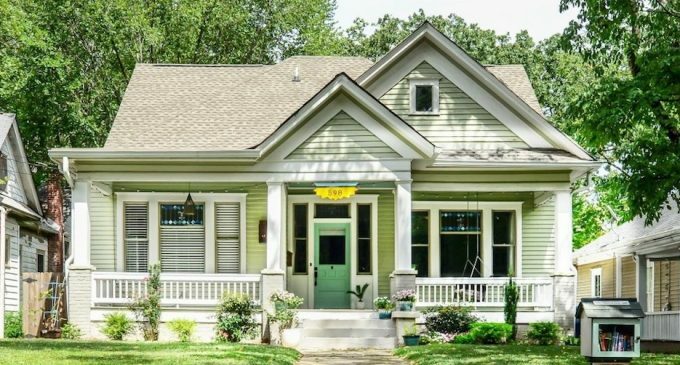 It took blood, sweat, tears and a little more than $200,000 to transform this neglected c.1905 Grant Park bungalow into a show stopping family home. Interior designer Carl Mattison and his business partner Rob Smith purchased the dilapidated home for $175,000 in May of 2013 before putting in another $205,000 to transform her into what you see below. The pair worked alongside Balustrade Properties and Round-Here Renovations. The property sold in April of 2014 for $550,000 and sold once again in September 2017 for $695,000. Large dormers were added to the unused attic space to add an additional 950 square feet with two bedrooms, a playroom and a bathroom. Doing so extended the useable square footage to a little over 2,700 with 4 bedrooms and 3 bathrooms. Before putting this post together, we made a quick before and after comparison graphic and shared it to our Unique New & Old Custom Homes group on Facebook. From there it was shared to other various old home pages and groups and we were shocked at some of the feedback. A large number of Facebook users doubted the restoration claiming the post was a scam, that it wasn’t the same house or that it’s impossible as the neighbouring homes look different. People seem so quick to claim things as fake news even with the facts right in front of them. We’d like to set the record straight. This house is real. It’s located in Grant Park in Atlanta and was completely redone inside and out by Carl Mattison Design. Don’t be so quick to criticize and claim things are fake when you haven’t done the research to see the truth.